"It's disappointing" because it will inconvenience fans, Monahan said. "People are still going to get here," but the transit authority could have delayed the work for a week until the festival was over." Although Monahan's disappointment is understandable, the repairs are likely not going to effect the festival's attendees too much; the O-Train wouldn't likely be a main transporter for fans (the Transitway will likely carry the lion's share of commuters), and those who would have used the O-Train are able to use bus service running along a virtually identical--if somewhat longer--route. And with the current schedule slated to finish the repairs August 14, even that is coming close to the beginning of the school year, when the O-Train's biggest ridership base--Carleton University students--begin using the service in large numbers again. Delaying the repairs, even just a week, would run the risk of having a further delay in construction, for whatever unseen reasons, cut dangerously close to or perhaps right into the school year. 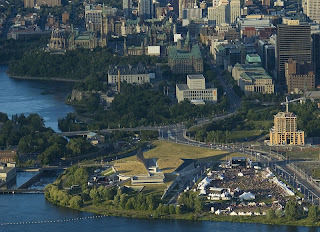 Will the repairs inconvenience any readers who plan on attending Bluesfest? Please feel free to discuss your thoughts in the comments. No, people should bike there, and park their bikes at one of Citizens for Safe Cycling's two supervised bicycle parking compounds! Of course Charles is right. I just find it puzzling that they have to shut the whole thing down to do maintenance. That isn't going to work out in the long run, is it? Why not adopt reasonable ongoing maintenance practices now? I suspect that regular upkeep was already ongoing. But every "x" number of years, you need to take your heavy hardware and give it a full checkup and overhaul it when need be. That's also part of "best practice" when it comes to transit maintenance. The timing of it happening now stinks, but probably can't be helped.